I first volunteered for the Animal Protective League (APL) in September of 2016. I had been saying for years that I wanted to take the training class and volunteer there regularly, but I never actually took the time to do it. Finally, the Community Support Campaign at work, through which I’ve donated money to various charities each year in order to ‘earn’ casual dress at work through December and January, started offering a non-financial option for earning two solid cold-weather months of jeans, t-shirts, and tennis shoes: 16 hours of volunteer service. My employer pays 16 hours of volunteer time off every year. Hell yeah I’ll get paid and rewarded with jeans for doing something I’ve been dying to do for years! I attended the orientation and found myself informed and motivated, ready to start helping animals! I decided after a tour of the shelter that I wanted to help most in Cat Nook, a large room with one long wall covered with three rows of cat kennels. The volunteering I wanted to do was cleaning enclosures, and I felt that my skills would be best utilized in this environment rather than a free range environment like the cat enclosures upstairs. Here, I would have the opportunity to spend personal time with each cat and ensure that each kennel was as clean as possible and fully stocked with the essentials: a clean blanket and toys, and a fresh litter box, food and water. Every time I volunteer, I know that for two and a half hours, I will work hard, get dirty, and give at least a dozen cats the attention and care they deserve. At first, I worried about falling in love with one (or all) of the cats and finding myself heartsick over not being able to adopt them. Ryne and I have been talking about getting a kitten for practically the past year, but not seriously enough to go looking for one. And it would have to be a kitten because of our older cats. Our female, Gwen, seems to only like her brother Hans. He’s eight and took to her relatively quickly when she came home three years ago, tiny and mewing and playing. At the shelter, I find it’s hard to get to know the kittens because they’re usually paired with other kittens in their kennel. Cleaning a kennel with kittens in it immediately becomes less about bonding and more about wrangling. Sometimes we move kitten groups to a large carrier so we can focus on getting the kennel cleaned without the distraction of kittens dive-bombing the floor and scampering about. They’re incredibly cute but harder to bond with than older cats, and I feel less of a need to dote on them because they’re kittens and they’re often adopted within days of arriving. I pay special attention to the cats I think have less chance of being visited and adopted. They’re older cats, black cats, and cats with issues. I bond with these cats, and though my heart hurts for their circumstances, I rest assured that all of their basic needs are being met and that they are receiving personal attention each and every day at the shelter, and that every couple of weeks, I get to be the one who provides that care and comfort for them. On Thursday September 28, 2017, everything changed. I put on a fresh pair of disposable gloves, grabbed two rags out of the soapy bucket, and as I wiped the front of Dimples and Giggles’ kennel, I made left eye contact with Giggles whose right eye was swollen nearly shut and pink and very wet. Giggles sneezed and looked back at me and said, in the tiniest, kitteniest way, “mew!” I felt this spark inside me, this ‘knowing’ that this kitten was meant to be our kitten. When the tech came back, I asked her whether Giggles was available for adoption and whether he was actually a boy or girl. She looked up his chart and confirmed he was a boy, that he had had an ulcer removed from his eye and subsequently scratched the wound open, that he was getting medication, and would probably be a foster-to-adopt situation, meaning the shelter would cover the medicine costs while we cared for him in our home. I was overjoyed and picked up an adoption form on my way out the door. That night, Ryne and I discussed the reality of adopting Giggles, including the associated costs and what we’d change his name to. The cost would be fairly low, since there’s no fee to foster until the actual adoption occurs (the adoption would cost $50), and Gwen had recently been to the vet and received her booster shots, which I confirmed via a phone call to her veterinarian. Hans’ shots were way out of date, so we knew we’d have to cover a checkup for him with our vet. We knew we didn’t want to call him Giggles, and our cats are historically named after people or characters who fell to their deaths: Hans for Hans Gruber, the antagonist from Die Hard, who fell to his death from a window after being shot in the shoulder; and Gwen for Gwen Stacy, who died from whiplash when Spider-Man caught her with his webbing after the Green Goblin threw her off of a bridge. The moment Ryne said the name “Moriarty”, I knew it was perfect. Our soon-to-be kitten was adorable and unique, quirky and brave. There was no doubt in my mind that he was already Moriarty. Ryne wasn’t totally sure, but trusted my judgement (and ended up agreeing). By the end of the evening, we decided that we would go to the APL on Saturday and take our Moriarty home! Saturday finally arrived, and I impatiently waited for it to be noon, the time the shelter opens each day for adoptions and other services. I sang “tiny kitten, tiny kitten, going to get our tiny kitten” (and multiple variations thereof) about six hundred times before we got there – I was so excited!! On our way inside, some friends of ours from a nearby town drove past us to park their car – they were there to pick up a dog they were adopting! My excitement amplified off of theirs and I had to steel myself in order to act like an adult as I walked into the shelter to do the adulty thing of adopting a baby animal with special needs. I handed over our paperwork to the guy behind the counter, Andrew, and he began making verification calls to our landlord (Ryne’s mom!) to ensure we were allowed to adopt a cat (thank you for saying yes!!) and to our veterinarians to ensure our established cats were up to date on their rabies and distemper vaccinations. He hung up with the vet and let us know how to spend our money…Gwen was only vaccinated for rabies, so we’d have to get her the distemper shot (plus associated vet visit cost), and Hans would need both vaccinations (which we already knew). I was upset at the added cost for Gwen, especially considering I had already called the vet and explained that we were adopting a kitten from the APL and they confirmed Gwen was up to date. Aargh! Luckily, in order to take the little guy home that day, all we had to do was make an appointment for Gwen and Hans’ vaccinations. Luckily again, our vet was still open after noon on a Saturday, so I called them for the second time that day and scheduled appointments for both kitties. Andrew called the vet back to confirm the appointments, then let us know we’d be able to take our new boy home that day! He told us that the shelter veterinarian had cleared him to be adopted (as opposed to fostered), and that we’d go home that day with the medication he’d need to clear up his eye. The shelter was a madhouse while we were there – the entire lobby was crammed with people – happy people, but people nonetheless. A guy walked in with twin humans in a stroller and six or so Siamese kittens in a carrier – I overheard him explain to another patient waiter that his family had been fostering these adorable kitties (side note: dude has TWINS and still has time to care for and raise BABY KITTENS!) and it was time for them to be adopted. It was fun watching everyone fawning over such tiny, beautiful little creatures, with their huge, curious eyes and bobbing heads. Finally our application was fully processed and we had been APPROVED to adopt our chosen one!! I grabbed Ryne and proudly marched him back to Cat Nook to meet his new cat-son…and it was absolute love at first sight. Giggles totally remembered me when I walked in (okay, doubtful…but he really did act like he was happy to see me!). I said, “Hey little guy – I told you I’d be back for you! Meet your new daddy!” I opened his kennel, picked him up, kissed his tiny mewing face and handed him over to my husband, who practically melted to the floor, overcome with joy and love. Moriarty was Giggles no more!! We put Moriarty back in his kennel after a few minutes and headed back up front to complete the paperwork and pay our dues. It turned out that he was born around June 19 and was already fixed. He was so tiny, I couldn’t believe he was already three and a half months old! Andrew reiterated that we’d be adopting him that day, not fostering. This was great news, but also worried me because I was expecting no cost for him that day – so I was happy when he followed up with a $25 adoption fee (half the normal fee!). We paid a small fee to transfer his microchip to my name, and walked out with a bag of Purina kitten food, eye drops and antibiotics, and our new little love all for $36. The car ride home was unique in that it was almost completely silent – I’d never met a cat who was quiet while in a carrier in the car until I met Moriarty. He’s not afraid of anything! We got him home and took him straight to our bedroom so we could bond a little before we had to take off for a few hours for a wedding. He had so much fun running back and forth between us on the bed…and he only peed on it once. Hans snuck in at some point while I was fetching dishes and blankets – he was very curious but didn’t appreciate Moriarty’s immediate and robust affections and hissed and ran away. Moriarty wasn’t fazed at all. Finally, we had to leave, so we set up a crate with a litter box, food, water, and clean blankets and closed the door so he wouldn’t be accosted while we were gone. As soon as we got back home, we brought him downstairs to hang out with us while we watched some TV. Gwen was nowhere to be found, but Hans hung out nearby most of the evening, cautiously curious. Moriarty played with the toys we got for him, but only if we tossed them around first to get him interested – he much preferred the scrap of paper he found on the floor. Cats. Moriarty was rambunctious and playful for a short while, and soon settled in with us to relax. He had a hard time falling asleep, though, because he was so busy watching TV. Watching his little head bob around while he followed shapes around on the screen was one of the cutest things I’ve ever seen. It was a wonderful night. It’s been two months since we brought Moriarty home, adopting him into our little family, and we feel so fortunate to have found him. He is quirky and unique, snuggly but independent, he mews sweet nothings at us, and he always uses the litter box. My heart is full and my legs are scratched to hell. I’m planning to train him…come, sit, stay…and he’s made it clear that he’s not really that interested in training. He’d rather continue climbing up our clothing (or our bare legs – he’s not picky) to perch on our shoulders and use the couch (and chair and bed) as scratchers despite having a brand new cat tree scratcher always available…which he also uses. He likes variety. He bites everything. He scratches everything. He plays with everything (while ignoring the actual toys we actually paid for). He climbs everything. He eats everything. He chases everything regardless of the amount of growling, hissing, or swatting the thing he’s chasing directs at him. He’s amazing and resilient. His eye has healed with seemingly no lasting damage. He’s beautiful. He’s going to be the best cat. Do you have a cat you love to pieces…or maybe one you don’t? Tell me about it in the comments! 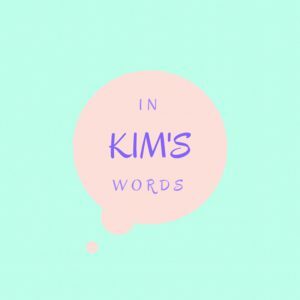 Don’t forget to subscribe to In Kim’s Words so you can always hear and see the latest about the one and only Moriarty!